2019 Crest III 240 SLC Tri-toon CP3 performance package powered with a Yamaha F200 hp. 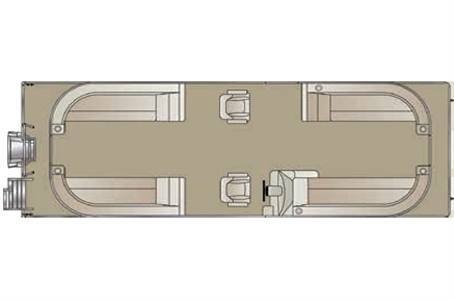 The Crest III's versatility is hands down and build on the same chassis as our top of the line pontoons. With abundant storage and cup holders a junior Beast ski tow bar, Fusion multi zone stereo and LED speakers, 29'' high back reclining, swiveling and sliding helm chair, custom seat bases, changing room, upgraded weathered gray flooring and much more! This boat has all the you need to enjoy everything on the water with friends and family. You can design the interior to fit your lifestyle. Whether you enjoy a relaxing day on the water or the thrill of watersports, Crest III can be tailored to deliver the experience you seek. Either way, every model is a masterpiece. Weight (approx) w/o Engine: 2,025 lb. Fuel Capacity - 2 Tube: 28 gal. Fuel Capacity (CPT): 40 gal. Fuel Capacity (CP3): 79 gal. LOA (measurement is from rear of transom to furthest point in bow): 23 ft. 5 in. Pontoon Diameter - 3 Tube (CP3) (Port/Center/Starboard): 25 in./26 in./25 in. Seacure Deck Construction - Thru Bolted and Screwed (CPT/CP3) in.